The State Minister for Climate Change Lily D’Ambrosio has done a terrific job overseeing the rapid expansion of renewable energy and is one of the stand-out ministers from the previous Andrews administration. 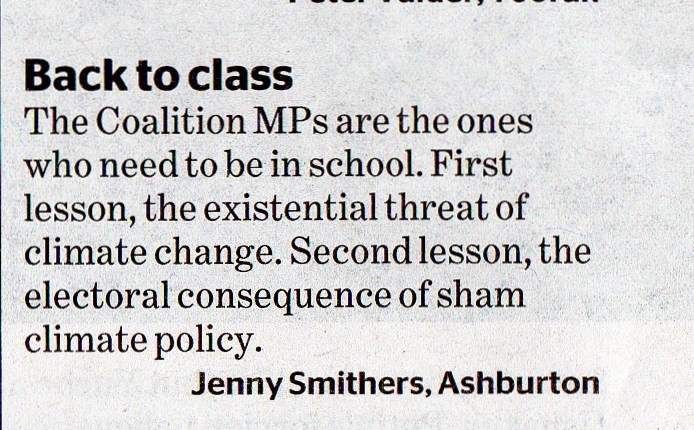 One of the problems she, and the Labor government face, is that a number of MPs in their party do not understand the problem of climate change – the relationship between producing CO2 emissions by various human activities and global warming. This applies equally to high levels in the bureaucracy – in particular the forestry (DELWP) and the old mines departments (Earth Resources) – both of which appear to be anchored in the past. Just transitions are not only needed in the Latrobe Valley but also in the bush where logging and timber milling are substantial emissions producers and need to be phased out as quickly as possible. Likewise the Earth Resources department remains tied to brown coal with its recent financial and ministerial support of the coal to hydrogen project. It is apparent that some government ministers need basic science / climate change lessons as do some senior bureaucrats. Any of the latter reluctant to change should be retired. On the matter of basic climate education I wrote previously: “When a government sympathetic to the science is elected they should immediately embark on a massive education program on the basic physics of climate change for the whole public. This is something that was missing from the Gillard government…” when they brought in the carbon tax. One would hope that governments, aside from the troglodytes in Canberra, are planning for a rapid phase-out of coal fired electricity generation as outlined in the recent Intergovernmental Panel on Climate Change report. When this report is applied to Gippsland the remaining 3 brown coal generators should be closed by 2030! Large projects like the Star of the South offshore wind project or a pumped hydro project adjacent to the Latrobe Valley are needed to be fast tracked to both provide employment and replace the current coal generated power with renewables. We also need to replace forest mining with forest protection and perhaps Earth Resources should be looking for some local supplies of lithium and attracting a battery manufacturer to the Valley as well.